I've had my eye on this one ever since I heard it was a modern retelling of Sleeping Beauty. I haven't read a Christopher Golden book in quite a long time and I was anxious to see what he was up to lately and how his take on the fairy tale stood up. My favorite retelling of Sleepy Beauty is Robin McKinley's Spindle's End (surprise, surprise) and that one definitely reshapes the tale in new and beautiful ways to allow Rosie to take a much more active role in her own life and with regards to the curse she lives under for so many years. Frankly, I was interested to see how a male writer would envision a modern version of the story and I really was not disappointed in the least. Rose wakes up in a hospital bed in an unfamiliar place, with the people around her speaking a language she cannot understand. Confused and disoriented, it isn't until her two aunts come into the room that she feels the first quaking reassurances that she is not crazy. For she recognizes her aunts and they speak in her native French to her. When she responds without trouble, and even begins to remember the English she once knew, the doctors relax a little. Having been in a coma for several years, it comes as a huge surprise to Rose that her aunts brought her to America to receive the best treatment they could find. They live in a small brownstone in downtown Boston and, as soon as she's ready and recuperated, they're going to take her there and help her pick up the threads of her life. And recover she does. But the dreams don't go away. Every night Rose dreams she is a princess in a faraway land, watching her father prepare the country for war, knowing it is a losing battle. Dark forces are assembling to destroy her kingdom and it seems Rose herself may be the only hope for averting total destruction. But her aunts brush these dreams off as vestiges of her coma and Rose tries to shrug them away as she starts school and tries to jump start her life again. Christopher Golden has come up with a great angle from which to tell this familiar tale. Waking up from the coma and only catching bits and snatches of her former life in disturbing dreams, it's easy for Rose to believe this is the only life she's ever led and that her Aunt Fay and her Aunt Suzette have nothing but her best interests at heart and are only trying to help her begin anew. I loved the strength Rose possessed, even with how fragmented her memory was and I loved how much she longed for normalcy and friends and earnestly went after the things she wanted. With her flowing skirts and straightforward attitude, she won me over even as she won over Kaylie, Dom, and Jared. Shunned by the popular crowd, and dubbed "Coma Girl" by pretty much everyone, she pushes through the horrors of high school with a determination and a thick skin I fully admired. Hampered by her seemingly insanely overprotective aunts, Rose struggles to engage in any kind of social life. Even with exuberant Kaylie and quietly interested Jared around encouraging her to step out a little and have some fun, Rose finds it hard to disobey her aunts in even the most minor of ways. I liked her for it. As aching as those restraints were, it was clear that her aunts were hiding something. Something huge. And I waited with baited breath for Rose to discover what it was and see how she chose to handle that new and fantastic knowledge. It really was her integrity of character and the very sweetly developing relationship with Jared that glued me to the page. The final conflict does happen rather suddenly (though pretty spectacularly) and I could have done with a slightly more protracted resolution--but when could I ever not? 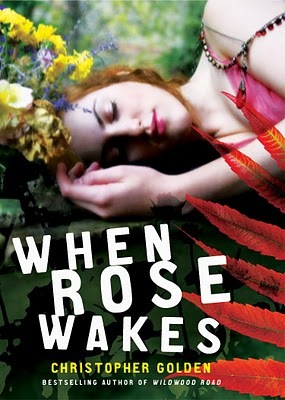 Overall, When Rose Wakes is a thoroughly engaging, light read and one I enjoyed from cover to cover. Recommended for fans of fairy tale retellings, gentle love stories, and strong heroines. Oh I forgot about this book - such a colorful cover! I like fairy tale retellings - and am a bit curious to see how this plays out! I recently featured this one and was wondering how it is, since I haven't read it yet. Thanks for your review! I'm glad you hear you enjoyed this book. Oooh a fairy tale retelling! *adds to wishlist* I love retellings. My favorite Sleeping Beauty retelling is Enchantment by Orson Scott Card. I've never read a book by Christopher Golden so I'm curious about this one. I agree with this assessment. I was hoping for a (slightly) slower build-up to the final conflict. But with only a few pages remaining, I figured we weren't going to get that slow build-up. Ooo this looks nice. I've never read a Sleeping Beauty retelling. I should fix that. This book has been on my radar since the first time I heard of it. I love fairy tale retellings. I'm glad to hear it's good! I've never read Robin McKinley's retelling. I think I'll have to do that soon since I loved her retelling of Beauty and the Beast. By the way, I received my copy of Jane today! I'll be starting the second finals are done. Thanks so much! So far I've enjoyed many of the fairy tale retellings I've read. This one also looks interesting. I just added it to my wishlist. I love fairy tale retellings, and I think the world of Christopher Golden, so this book makes me VERY happy! Definitely always up for a fairy tale re-telling. This big secret of Rosie's past sounds very tantalizing. I love modern fairy tales if they're done right. I will definitely have to check this one out! I love Golden so will definitely check this out - great review!